A rogue band of crooked human scientists discovered Soundwave and his loyal servant, Laserbeak, floating high above the Earth. These scientists soon learned how to control the Decepticons by transmitting an advanced set of encrypted radio signals directly to the collector dish of Soundwave. Autobots and humans beware: these fanatics now wield the awesome destructive power of two Decepticons! Prelude: Poor, poor Dark of the Moon toy line, what have they done to you? After the exceedingly brilliant toys from Revenge of the Fallen you became the test subject for child suitability. Less paint, less size, and even worse: fewer joints. As compensation they included the Mechtech Weapon system. Collectors did take little comfort in those large, ridiculously oversized guns, though. Of course there are some really nice figures in the line, too, but not enough to prevent the early cancellation of the entire toy line, at least for US retailers. The final toys of the line were only seen on-shelf in some Asian countries and, luckily, in Japan by way of Takara-Tomy. Let us take a look at one of these forgotten ones. Packaging: A nice big window box displaying the figure before a fitting background. For all those who know the Human Alliance toys, there is nothing new to say in terms of looks. The only way you know that this is a Takara version in front of you is through two stickers saying TF in Japanese. A small one on the front, a large one on the bottom. And, of course, the included collectors card, which all Japanese DOTM toys had. In Soundwave’s case it is pretty much the same card as the deluxe version had, only a few minor changes in his bio statistics. Partner and Accessories: Let us get the crap out of the way first. For one, there is Laserbeak aka the Turkey-of-Death. Compared to his deluxe self he is quite simplified and no, he does not look good at all. If you want a Laserbeak, go for the deluxe. Only the „feathers” got a little of metallic red paint, which looks nice. But that is it. Articulation for such a figure is ok but could have been better since they included a free design error. Why did they have to attach the legs to his wings instead of the body? Anyway, he transforms into a kind of big cannon - which still has feathers by the way - and can be mounted either on Soundwave_s shoulder or be used to fly(?) by Mr. Gould. Speaking of Mister pretty boy, he is included as well. A standard Human Alliance human, nothing more. Both of these are nice but somewhat unnecessary and for me, they will stay in the box. Alternate Mode: There he is, the Mercedes SLS AMG with folding-doors. As I mentioned you can already see in the package that those winged doors are actually working without any tricks or shortcuts. Very nice. Now let us take a look at some things that were already discussed prior to this release. For one, his size in vehicle mode. He appears small but he is not. Significantly bigger than his deluxe version of course and even quite a bit bigger than the Pontiac Solstice from HA Jazz. So I think they did about right compared to the real-live vehicles. For details: black air intakes, perforated disc brakes behind silver-painted rims as well as blue-tinted windows. On the front grill and in the middle of the rims you can clearly see the typical Mercedes star. And to top it off, on his back it also says SLS and AMG, sadly unpainted like the rear mirrors and the rear wiper. But there is a sweet, sweet „Superior“ license plate. So all the necessary details are actually there, even if some did not get the proper painting. Speaking of paint, also a much-discussed topic before he was released. He does not have a full body paint-job but surprisingly he does not come in the usual dull DOTM gray, either. It seems they mixed some kind of silver and sparkle painting into the plastic. So he actually looks shiny, not as much as he would with a full paint job, but far from the dull gray of his deluxe version. Still, compared to HA Jazz, they could have done a little more, but all in all he look far better than anticipated and even ranks up to one of the best-looking DOTM vehicle modes. Transformation: Taking my first look at the instructions, I thought: well, a lot to do here. And there is. Not really complicated as much as there are just a hell of a lot of steps to switch from one mode to the other. A lot of twists and turns and many little pieces to pull or flip out, not really for the transformation as such, but for extra details. But he is still easier to do than his deluxe version, which has the problem that all the parts are somewhat in the way of each other. His chest is real, so no fake like on the deluxe, this time it actually is the front grill of the vehicle. Somewhat fascinating is the fact that everything below his waist is squished into his vehicle trunk section. Kind of like HA Jazz, although he had the bonus of having the car seats on his feet, more on that later. 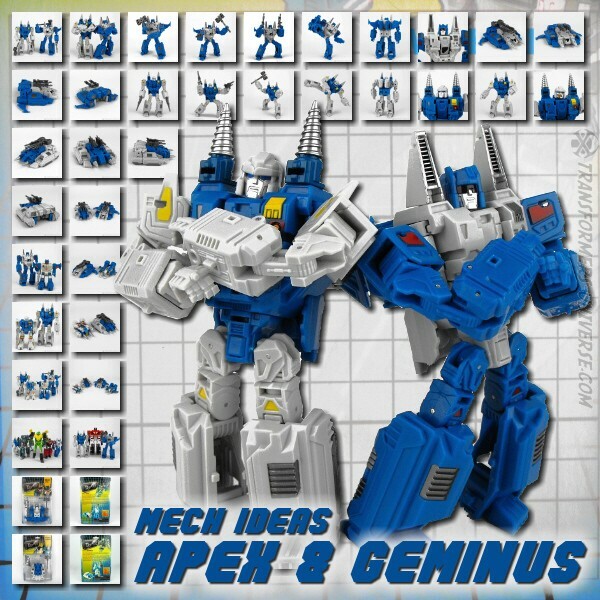 If you want a complex and busy transformation and DOTM disappointed so far, then this is the right figure for you. It looks harder than it is but for me it is well thought-out and a lot of fun. Robot Mode: I must admit, all the promotional pictures did not leave a very good first impression on me. My first thoughts were about a big kibble-bot with skinny legs and tentacle feet. A little of that held true, but most of it reversed itself. His upper body is big and he definitely makes a bid for Mr. Universe of Cybertron among TF toys. But this does not hinder or limit his poseabillity in any way, all his body mass is well proportioned and in the right place. Again, compared to his deluxe incarnation his own parts are not permanently in the way of each other. Supported by lots and lots of joints, he really has a lot of them. Even more in his legs. His abdominal region, including the crotch, and the legs are a little thin compared to the rest of him, but it looks okay and way better in hand. Only the feet are not really my thing and I would have preferred them a little more screen accurate. Thinking about feet like those HFTD Highbrow came with, more than just three tentacles. Maybe they had better used the remaining plastic on that instead of the turkey. But nonetheless, he stands solid and with lots and lots of posing options due to the high amount of joints in his legs. Very solid, but not very tall, unfortunately. Despite being the smaller vehicle, HA Jazz becomes the bigger robot while Soundwave goes for more wideness. For robot details, well, I guess they did not use more paint than usual, but this time they used colored plastic and even in the right places. He has a lot of sculpted details, which are not all instantly visible, but I must say he looks very cool and just about right. Even more so because of his wonderfully sculpted head, which I like very much. So all in all I am pretty satisfied with him and what he looks like. For me, he is definitely the best Movie Soundwave, easily beating out the ROTF and other DOTM versions. So very much worth getting for your collection of Movie toys. Conclusion: Not easy to say. On one side he is the best DOTM and all-Movie Soundwave, period, but on the other hand he is also the most expensive one and not easy to get. Thanks, Hasbro, for quitting early in the United States. You will need to relay on Asia and Japan to get him, which explains why the price is consistently going up for him and even the inferior deluxe version. Compared to each other the HA will probably cost you twice as much, but you will get what feels like three times the Bot and a much nicer looking car on a bigger scale for it. So if you want the best Soundwave for your Movie collection so far, then get the HA version. Both modes are not perfect, but as Movie and DOTM Soundwaves go, this is the big, big, mean robot he is supposed to be, and a nice car as well. HA Jazz will probably stay my favorite of all the HA toys, but DOTM HA Soundwave is right behind him and not just one of the last, but definitely one of the best DOTM toys out there.